After finishing up my Yoga Tune Up Teacher Training I decided I wanted a fresh zesty roast chicken with all the fixins’. 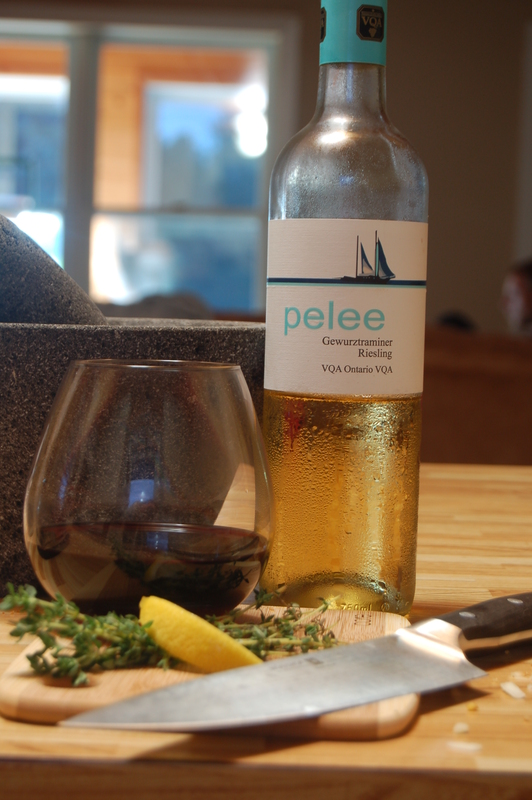 So I poured myself a glass of red wine and began my favorite kind of meditation – cooking. I love to get lost in the process, the smells, the flavors and the presentation. I feel like it is an area in my life where I can let go and trust my instincts to produce something wonderful. Don’t get me wrong I’ve had some epic cooking fails but that is all part of experimenting and being playful with your creations. 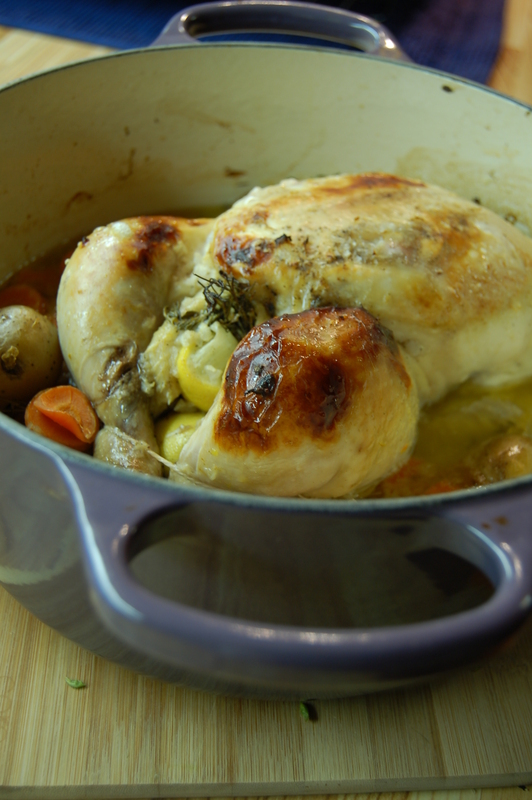 This is a go to meal for us; we like to do roast chicken once every few weeks and use the bones for stock. I always try to mix it up because we eat it so often. The challenge this time was to move away from the hearty roast chickens and root vegetables of winter toward a fresher summer dish. 2. Cut the Lemon into quarters and squeeze one over the chicken. Stuff the lemon, whole garlic cloves, half of the thyme and one table spoon of butter inside the chicken. 3. Put the remaining butter under the skin of the chicken. 4. Rub the chicken with salt, pepper and half of the pressed garlic. 5. Place the chicken, breasts down in the dutch oven. 6. In a large bowl combine potatoes, carrots, remaining onions/pressed garlic, thyme, pinch of salt, lots of pepper and the white wine. Mix so potatoes are covered and then pour around the chicken in the dutch oven. 7. Place the dutch oven in the oven for 45 minutes with the lid on. 8. Remove the dutch oven and scoop the potatoes and carrots out and onto a baking tray and bake until crispy (7 mins then flip and 7 minutes more). I use my toaster oven to do this because I don’t have room for both in the big oven. If you don’t have a toaster oven simply broil the potatoes while the chicken rests and you make the gravy. 9. Flip the chicken so the breasts are up and place the dutch oven back inside without the lid. Cook for 15 more minutes or until the skin becomes crispy golden brown. Sometimes if the chicken is already close to 165 I will use broil so it crisps quicker. It is important to check the temperature of the chicken often after this point. If you over cook it the meat will be dry. 10. Remove the chicken from the oven (don’t forget to turn it off). You can leave the potatoes inside until you are ready to eat. Place the chicken on a cutting board to rest while you make the gravy. 11. In a small frying pan or pot on low heat melt the butter until it starts to smell nutty. Add the flour until a thin paste has formed. 12. 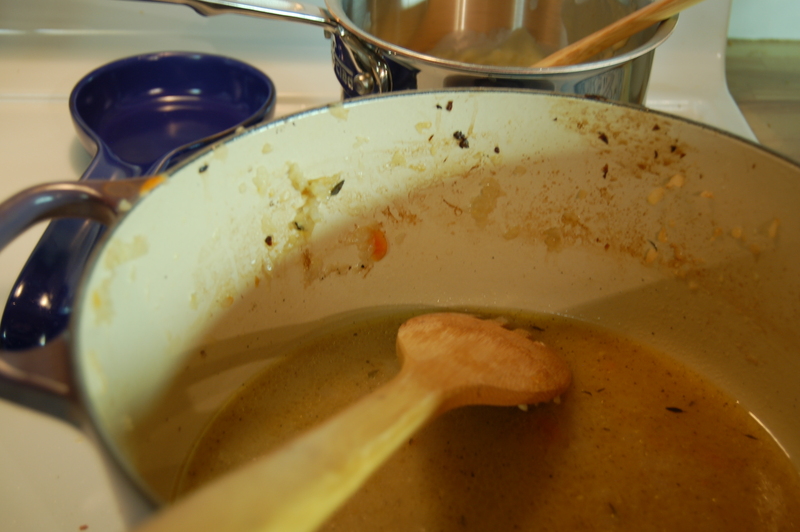 Place the dutch oven full of the chicken juices on the stove at medium heat and whisk in the paste. Bring to a simmer and stir until it thickens. If it not thick enough add more butter flour mixture. Add salt and pepper to taste. Now it is ready to carve and serve! 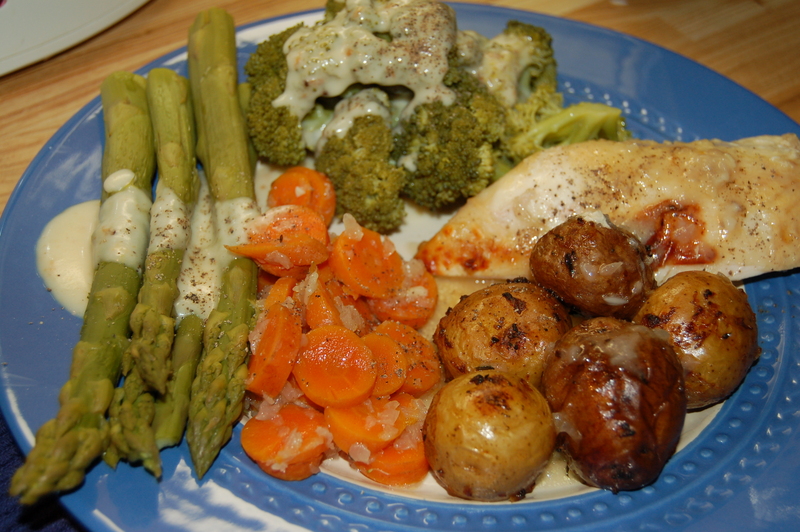 We had broccoli and asparagus with a double smoked cheese sauce on the side. It can be served with anything you like. I find in spring a fresh salad or lightly steamed veggies are perfect.